Sandberg, Sheryl. ﻿Lean in : women, work, and the will to lead. Losse, Katherine. The boy kings : a journey into the heart of the social network. Free Press, 2012. Last week, 9 Fuqua staff members met over lunch to discuss the book Lean In by Sheryl Sandberg. Originally, the summer reading group was organized to give Fuqua staff some personal experience with using ebooks on Ford Library Kindles. But once the group met and began sharing their thoughts, these voices from a cross section of Fuqua created their own medley of ideas and experiences about careers and leadership. Sheryl Sandberg would have approved. She is chief operating officer at Facebook, a 40-something wonder woman who has engineered a rocket trajectory for her career: Harvard MBA, protégé of Larry Sommers at the World Bank, chief of staff at U.S. Treasury, V.P of global online sales at Google, and currently COO at Facebook. If you have seen her TED talk or watched her promoting her book on television, you know that she has an articulate, authentic and ardent style. Her goal is to add more women to the highest levels of every organization to ultimately foster better work-life policies, to reduce gender gaps in compensation and to promote more women into midlevel management. She posits that more female leadership will lead to fairer treatment for all workers. Sandberg acknowledges that there are barriers to success for women in the workplace but the focus of her book is on the internal obstacles for women. Women unintentionally hold themselves back by lacking confidence and avoiding risk. Sandberg encourages women to dream big and to achieve their full potential despite societal and workplace barriers. Women advance to leadership by reaching for more opportunities, by remaining engaged and by acting self-confidently. She advises women to negotiate salaries and to keep acquiring new skills, accepting positions up, across and perhaps down the organization. Sandberg explains how to get help from others in identifying and acquiring a mentor and by treating one’s partner as an equal. The book is well researched and documented but at the same time, the tone is conversational and contains many personal anecdotes. 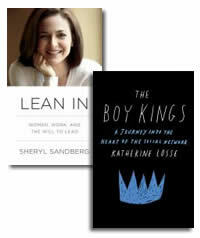 Last year Katherine Losse published her own book, The Boy Kings, about her experiences at Facebook, where she worked 2005-10, including two years with Sheryl Sandberg. Losse was the 51st employee hired at Facebook where the atmosphere was intense. In the early years, employees shared a sense of camaraderie and promise. Facebook was more like a cause than a workplace. As Losse worked her way up the organization, however, the significant levels of compensation were reserved for top leadership and engineers. As other employees accepted increasing responsibility, the rewards did not follow. Losse also observes several ironies regarding Facebook. Social media was designed to bring people together, yet Facebook employees used IM to communicate, even if they were in the same room. Facebook hoped to design a new world, but the company was largely populated with young male engineers who no longer experienced life outside the building. And Facebook preached about transparency, yet often used information provided by members without regard for privacy — and company leadership was equally opaque to the people working there. The Boy Kings is repetitive in places and could benefit from further editing. However, the book addresses interesting issues about social media, society and start-ups, which makes The Boy Kings an entertaining and easy read. Recommended. Beginning on August 1, 2013, the availability of Harvard Business Review and The Financial Times will be changing in online resources available to Duke University. Note that these changes will NOT affect the ability of Duke faculty to use Harvard Business Review and The Financial Times content in their print coursepacks and Sakai sites as long as the necessary copyright clearance is obtained. Effective August 1st, 500 selected Harvard Business Review articles will become “read-only” in EBSCO’s Business Source Complete database. This change will affect all Duke users; and means that the affected articles can only be read online; but not printed, downloaded, or linked to. The 500 selected articles are composed of what Harvard considers its “business classics”, e.g. Michael Porter’s The Five Competitive Forces that Shape Strategy. Duke users will still be able to locate these articles by searching the database for them; but will be limited to reading them online. Effective August 1st, full text articles from The Financial Times newspaper will be subject to a 30 day rolling embargo in all databases subscribed to by Duke Libraries. A rolling embargo means that articles published within 30 days of the current date are not available. E.g. an article published in the August 1 edition of The Financial Times will not be available in library databases until 30 days after August 1. Users of the FT.com web site have no-fee access to 8 full text articles every 30 days (including recent content) with registration. After a user exceeds their 8 no-fee article views, the user must wait until the next 30 day period; or may pay for a selected level of access to current content as described on the FT.com web site. If you have comments or questions about the above content changes, please email us at reference-librarians@fuqua.duke.edu. On May 8, Bloomberg Businessweek reported that two second-year MBA students from Fuqua took first place in a case competition that challenged teams from 70 schools to devise ways of developing diverse workforce talent in science, technology, engineering and math. Four months earlier, another Fuqua team won the Deloitte National MBA Case Competition. Mark Brown, who leads Fuqua’s Management Communications Center, says that is not unusual. One reason that Fuqua teams win MBA case competitions year after year is because they excel at telling stories – not just the random anecdote, but stories that resonate deeply with people, inspiring listeners to find a particular meaning in events and to share their views. He explains that even in the cold world of business activity, stories still resonate with people, eliciting an emotional response. The story of a corporate merger uses a “boy meets girl” narrative. The story of responding to disruptive technology is equivalent to Stranger in a Strange Land. At Fuqua, storytelling is taught to first year MBA students soon after they arrive in August. As part of the Global Institute, students learn the art of storytelling in Leadership, Ethics and Organization (LEO) (MANAGEMT 730). This course teaches students how to build successful teams and how to become a leader. It also shows students better ways to communicate, including how to create credible stories. Fuqua students also have an opportunity to hone their skill in the Leadership Communication courses (MGMTCOM 567/568). But the larger business world is also interested in better ways of communicating. In the Ford Library, three new books on storytelling explain how to tell a quality story. Winning the story wars by Jonah Sachs. In today’s noisy media marketplace, marketers must cut through the chaos to capture the attention of the audience, and to inspire people to take the message viral. The most successful marketers do this through stories, narratives that influence people’s behavior by reminding them of who are they are and how they should act. Author Jonah Sachs uses mythology, history and psychology to explain how characters in successful stories struggle to reach their potential and to create a better world. He uses dozens of examples from successful and failed campaigns of the past to offer insight and understanding in creating one’s own story. He also provides a simple strategy for crafting a story that is 100 years old: Be interesting. Tell the truth. And if you can’t tell the truth, change what you’re doing so you can. While the focus of the book is on marketing, examples are also from entertainment and politics. Storytelling in business : the authentic and fluent organization by Janis Forman. Author Janis Forman is Mark Brown’s counterpart at UCLA. She writes her book for business professionals who want to create succinct and memorable messages to accomplish their goals. She outlines a framework for organizational storytelling and illustrates four cases (Schering-Plough, Chevron, Fed-Ex and Philips) where stories were used to communicate about strategic directions or to build trust in the company/brand. The book ends by explaining how to find and develop a signature story. Lead with a story : a guide to crafting business narratives… by Paul Smith. Paul Smith begins his book with a story about his company, Procter & Gamble, where he is director of Consumer & Communications Research. Illustrating the power of storytelling to teach, his book presents 100 stories that provide insights into solving difficult leadership challenges. These stories can be retold as they are written, or they can serve as a springboard for inspiring the reader’s own stories. He also outlines a structure for crafting a business narrative with emotional appeal. 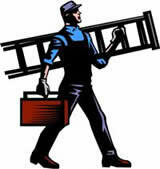 ﻿Wiring maintenance continues in the Library which may not conclude until the end of the day on Monday, July 15. Disruptions to Library users have been minimal so far; but please be aware that there may be construction noise in the Library on that day. We have individually wrapped pairs of earplugs available at our Circulation Desk if the noise becomes too annoying. Our apologies for any inconvenience this causes! Ford Library will be closed Thursday, July 4th in observance of Independence Day. Our summer hours will resume on Friday, July 5th. Wiring maintenance is also currently underway in the Library which may not conclude until the end of the day on Monday, July 8. Disruptions to Library users have been minimal so far; but please be aware that there may be construction noise in the Library on that day.